We wanted to share a recent project design to show you a Virtual Interior Designer at Work! 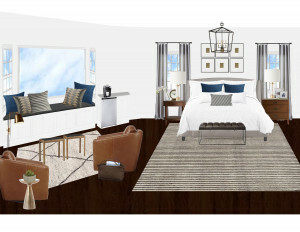 This room was for a client that desired a somewhat modern, fresh yet warm Mater Bedroom design. No florals, limited prints and something that would appeal to both her and her husband. By using a mix of stripes, earthy tones in both cool and warm colors as well of lots of different texture – we think this design hits the mark!